Appartement d'1 chambre, dans une propriété typique de Séville avec jolie cour intérieure, plantes et fontaine. Situé sur l'emblématique Plaza Santa Cruz, une place charmante et tranquille au coeur du quartier du même nom. Salon spacieux et lumineux avec canapé, table basse, TV et table à manger. Porte-fenêtre donnant sur la cour intérieure. Cuisine indépendante bien équipée, avec four, micro-ondes et lave-linge. Chambre avec lit double et grande armoire. Il y a un lit supplémentaire dans le salon pour une 3ème personne. 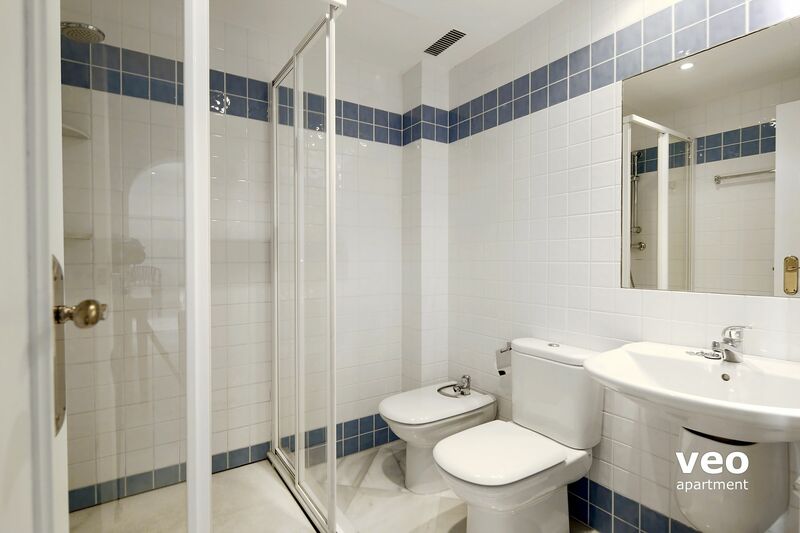 Salle de bains complète avec lavabo, bidet, WC et douche. There is air-conditiong (with cooling only) for summer, and 3 electric radiators for the winter months. Les pièces principales donnent sur la cour intérieure, très calme (car seuls les résidents de la propriété y ont accès). Santa Cruz est un des quartiers les plus charmants et colorés de Séville. Il est délimité par la cathédrale et les murs arabes du palais de l´Alcazar, résidence royale et exemple superbe d´architecture mudéjar. Une promenade dans le labyrinthe de ruelles et de petites places de cet ancien quartier juif est un vrai voyage dans le temps. Au printemps, vous serez transporés par l´arôme des fleurs d´orangers des arbres qui ornent ses rues. Découvrez la grande variété de bars à “tapas” et de restaurants traditionnels placés entre les maisons blanchies à la chaux avec de belles cours intérieurs, protégées du soleil andalou. Vous pouvez aussi visiter l´ancien Hôpital des Vénérables, reconconverti en musée. Cours, ruelles, places, maisons somptueuses et églises. La consommation d'électricité se réglée à part, sur la base des factures originales ou, le cas échéant, de la lecture du compteur électrique (0.20 EUR /kWh). À cette fin, une caution de 100 EUR pour chaque mois réservé vous sera demandée. Celle-ci devra être versée en plus du loyer mensuel, et vous sera rendue le jour avant votre départ, une fois votre consommation d'électricité déduite. 1​6​:00 à 2​2​:00h. Supplément pour arrivée tardive ​à partir de​ 2​2​:00h: 20 EUR (à payer en espèces à l'arrivée). Berceau: Gratuit. À préciser dans le formulaire de réservation. Transfert aéroport: 30 EUR (1-4 pax). 5 EUR extra pour service de nuit, de 22:00 à 08:00. Réservation requise par email. Very clean, comfortable apartment with everything we needed for a week's stay here. Plentiful crockery cutlery, saucepans in kitchen, we never actually used cooker as there were plenty of restaurants to try out within a short walk .Although a busy area just streets away this apartment is very quiet. A very lovely area. The check-in went smoothly with someone waiting for us at apartment after we made contact on landing. We were given a map and shown where to buy groceries etc. It was a great help that veo apartments allowed us to leave our luggage in flat until late on checkout day as we had a late flight ( no one had booked in for that day). Thank you so much for that. We had a lovely stay here and would definitely recommend it to others. "Ubicación excelente confort mejorable "
Apartamento idealmente situado en el corazón de Santa Cruz idealmente para una pareja. Colchón algo blando y canapé poco confortable. Nos recibió un señor muy amable que nos indicó unos restaurantes y nos pudimos quedar en el apartamento unas horas más porque no había nadie después de Boston. "Very nice place. Well maintained and a great location!" 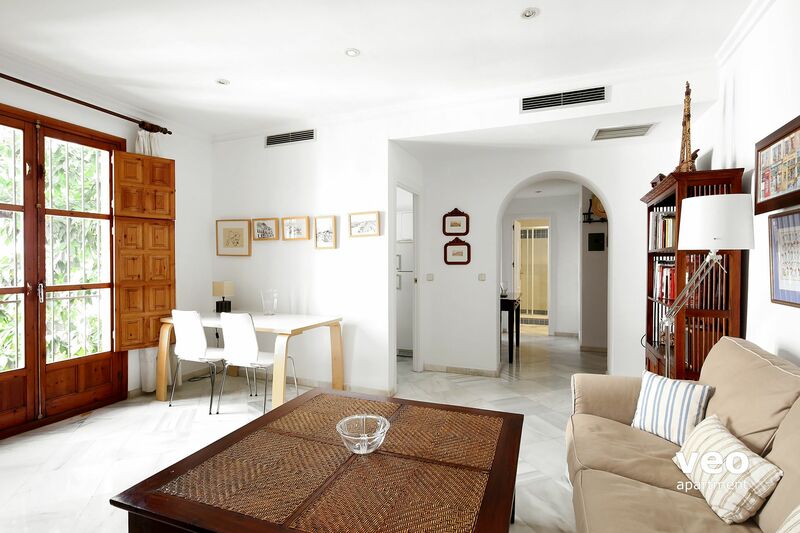 the apartment is nicely located on plza Sta Cruz close to several nice restaurants and very close to the old city center. "Quiet apartment in a wonderful location." 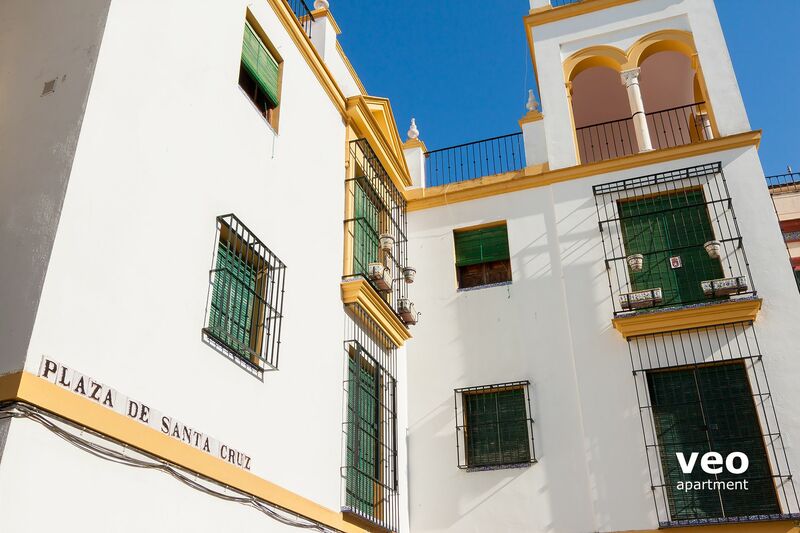 Plaza Santa Cruz B is a wonderful location for a stay in Seville. The apartment met or exceeded our expectations. It was well stocked with necessary supplies, clean, and modern. The private garden with fountain was a delight. Our check-in person, Estelle, was very friendly and efficient. 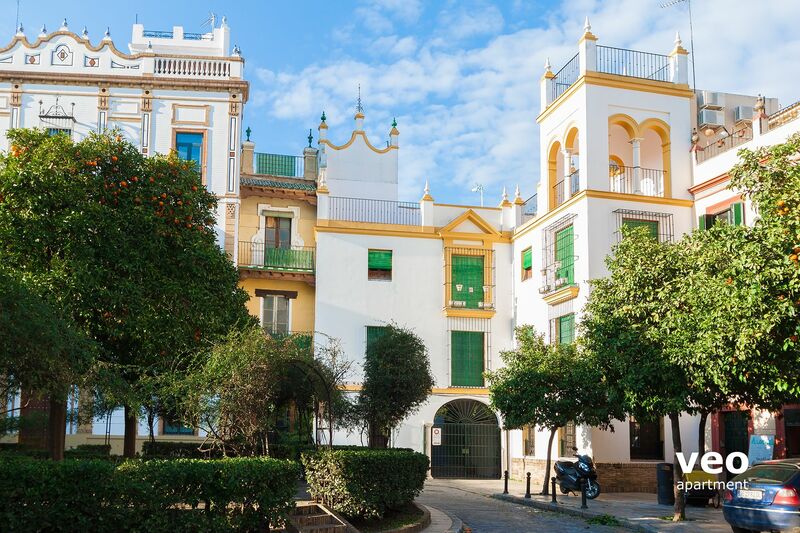 "Wonderful experience of Sevilla "
Santa Cruz Apartment was excellent value in a quiet location that is central to everything ! The staff was very available and very helpful before and during our stay. The apartment is roomy, the bed and pillows comfortable, and the linens were crisp! We found a grocery store right after we arrived and loved having our own light breakfast in the apartment each morning in our pajamas while we planned our day and enjoyed the tranquil setting: the aroma of blooming honeysuckle, the gurgling fountain, and the cool breeze! My wife and I enjoyed our stay in this apartment very much. It's not very big, but it's fine for two people. It was furnished with very thing one expects to find in apartment rentals. 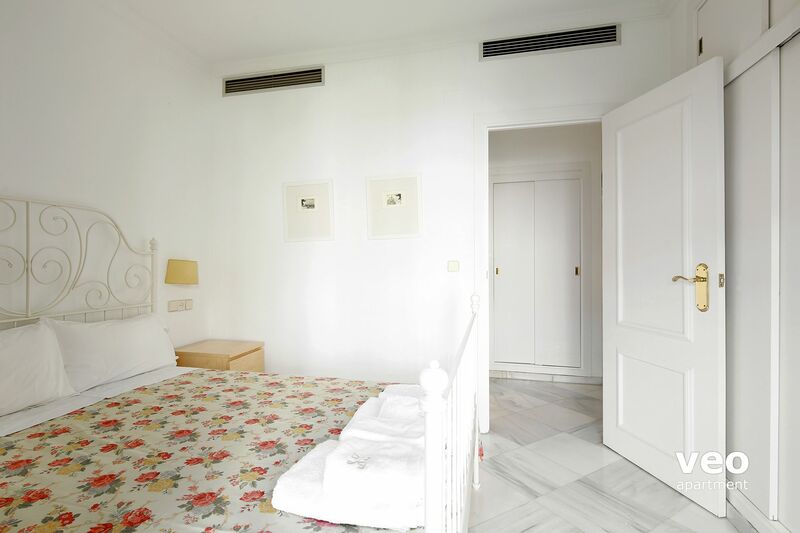 We have rented apartments many times in Spain and Italy. Only shortcoming was that the coffee makers didn't work. They both were missing parts. Hopefully they have been replaced by now. It's very well separated from the traffic noise. The building is in a pedestrian only zone, and you need to enter an exterior gate, and pass through a small courtyard to reach the apartment. The building is very well maintained and felt very safe. We would certainly stay there again. The Veoapartment people were very easy to work with. Ester met us in front of the building shortly after our arrival, and showed us around the apartment. They even booked a taxi for us for the morning we left. Overall a great experience. This was a lovely place. Santa Cruz Plaza is charming. We found the flat rather dark as the vegetation outside has not been cut back in quite a while. We have stayed in Seville six times now, three times with Veo. This apartment had the best bathroom of them all which was much appreciated. Needless to say Seville did not disappoint. 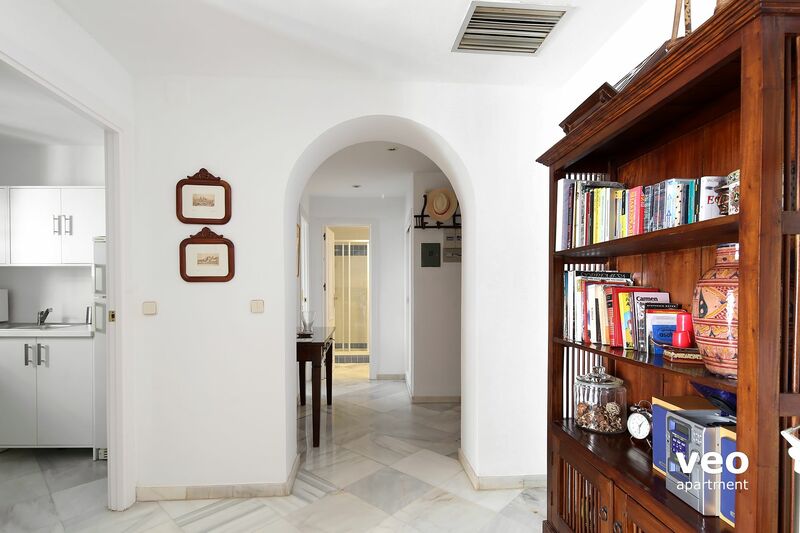 "Great apartment in a fantastic location"
This apartment is set within a traditional Spanish house with a beautiful garden giving lovely views making it feel cool and tranquil. The apartment itself is well equipped making our stay comfortable. 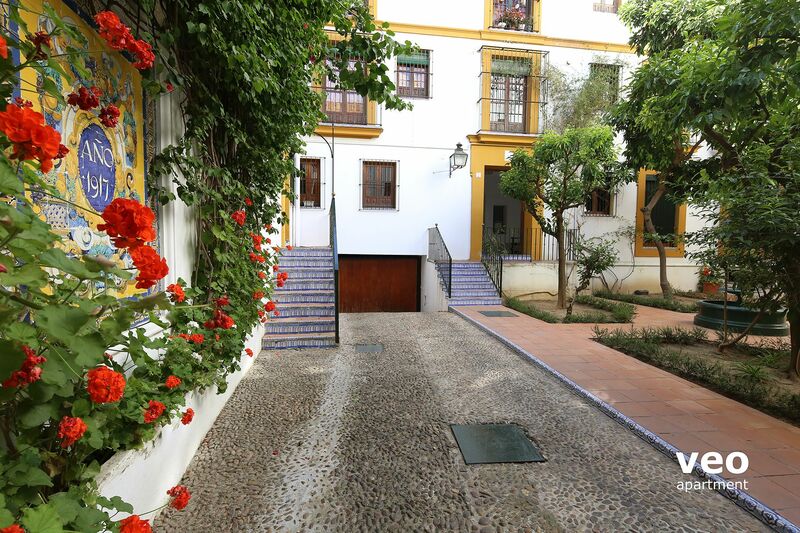 The location is amazing and quiet despite being in the heart of the historic centre of Seville. "Pour nous emplacement idéal pour se promener dans Séville"
"It was a good experience"
"Charming apartment in perfect location"
We feel very lucky to have found such a wonderful apartment in such a perfect location on such short notice. It was close to every place we wanted to go, but quietly apart from all the noise of the Santa Cruz barrio. Gonzalo was waiting for us when we arrived and was very helpful. We would definitely stay here again! 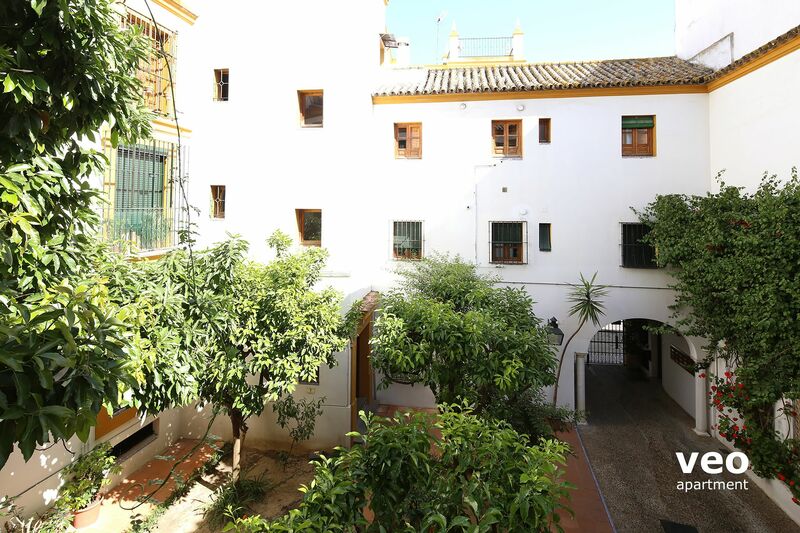 "Lovely apartment in ideal location"
The apartment is ideally situated, it's a stone's throw to bars and cafe (but quiet) and very close to the Cathedral and Alcazar. There's a climbing plant growing up the front of the apartment building so the bedroom has a beautiful view of this plant winding its way around the wrought iron grille in front of the window so it's not easy for anyone to see in but the light gets in and we could see out. However, it has obstructed the light in the kitchen but we weren't in there much. Overall the apartment is bright. The 3rd bed in the living room is not particularly comfortable, the one in the bedroom is though. Paco (owner's son) was very friendly and helpful. Can definitely recommend this if you want an apartment. 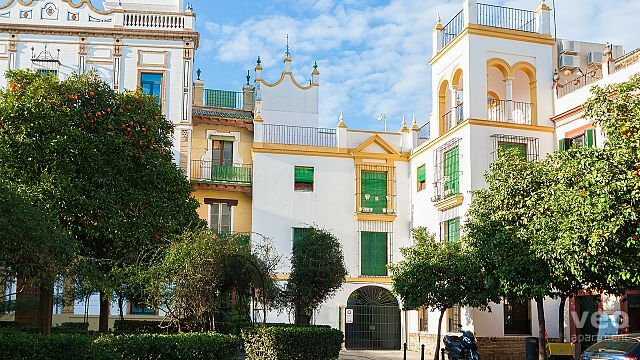 "Estaba limpio con todo lo necesario dentro"
"Quiet, central, clean and cool"
Really enjoyed this quiet apartment and it's very convenient location to the old town and many of the attractions, especially in the fierce heat of a Sevilla summer. We would definitely choose to stay here again. "Easy check-in and beautiful apartment!" "Tres bon sejour a SEVILLE ou nous avons pu en plus faire la féria d'Avril"
à tapas et les salles flamenco. "Apartamento tranquilo y bien situado"
Hemos pasado una semana agradable. El piso es confortable y bien equipado. Paco es muy simpático y atento. El único pero : el colchón algo blando para mi gusto. 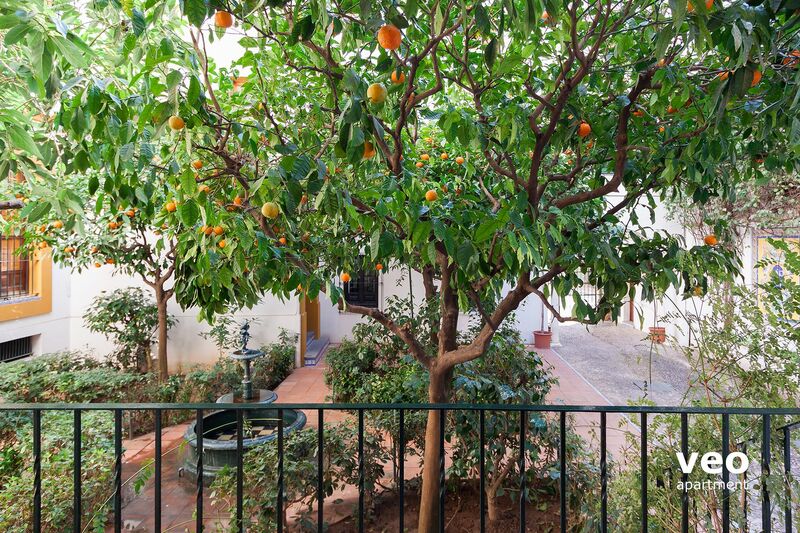 "Unbeatable location on a quiet square between the Barrio Santa Cruz and the Murillo Gardents"
Older apartment with adequate furnishings on the second level (first floor) with a small balcony that looks out to an interior courtyard with a small fountain and garden. Well stocked kitchen. Not particularly plush but it's comfortable and has plenty of space for two people. My only real complaint is with the somewhat loud central A/C unit that is either on or off. There's no automatic thermostat; you actually have to flip a switch on the circuit breaker to turn it on or off. It's a bit awkward to have to get up at night to turn it off because the room is getting too cold. The manager for the apartment, "Paco," answered the phone right off when we arrived at the train station and met us out front of the apartment in the 15 minutes it took to take the taxi into town. We spent four nights here, and given the cost and location, this was a terrific bargain. 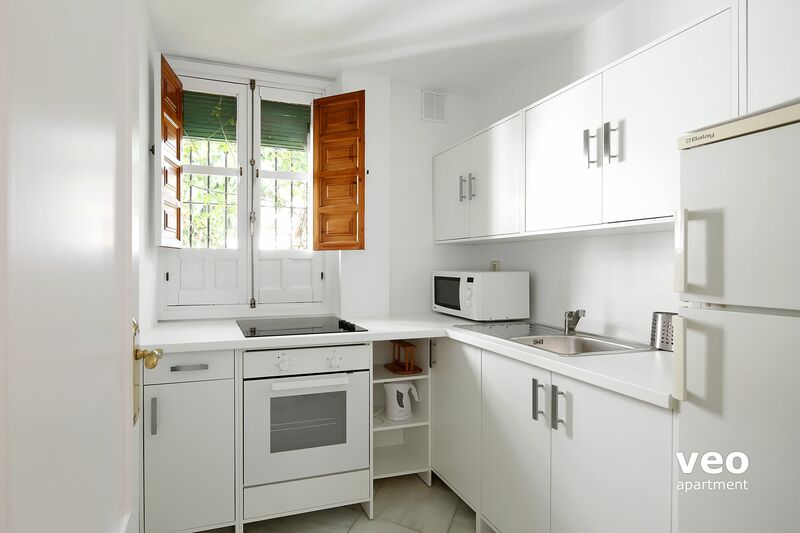 "Great location and apartment in Sevilla"
The apartment is comfortable and as advertised except for the small kitchen which is even better than pictured. "La douceur de vivre à Séville"
Appartement bien situé, près de tout donnant sur une cour intérieure qui assure la tranquillité dans un quartier très animé . Nous y avons vécu 2 semaines et comptons y revenir un jour . "Excellent central location for a great and quite apartment!" 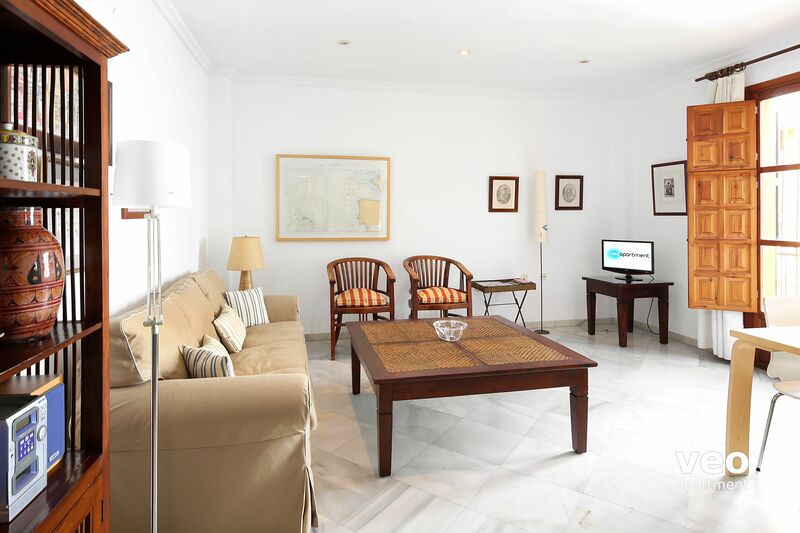 Friendly welcome, well decorated with white marble floors, quite, perfectly cleaned apartement close to cathedral, Alcazar and restaurants. To recommend and will definitely go back. This apartment was a peaceful haven with plenty of room after several hotel room stays. Absolutely no problems in the heart of Seville. Well equipped and had everything we needed. "Appartement charmant, apartamento muy bonito"
Excellente position centrale dans quartier charmant. "The apartment was central, quiet, large, well equipped, clean and comfortable. Would stay here again." "Great apt in great location"
Brand new 1 bedroom, very comfortable. Approx 1/2 mile from Plaza Nueva and 1/2 mile from San Nicolas lookout. Great location with easy access to best parts of town. Our host Victor gave lots of good restaurant recommendations on a detailed map. The apartment is perfect for a couple--small, but with a feeling of openness because of the great windows and truly wonderful light. It is quite adequate for short stays, but would be less comfortable for stays of more than 4 or 5 days or of you would like to do more in the tight kitchen than prepare coffee in the morning or heat up some soup at night. We appreciated the good hot shower and the ample towels provided. Our stay was in winter, and the apartment was heated by two portable space heaters. At first this did not seem adequate, and we were uncomfortable the first night, but gradually they warmed the space very well. The apartment was clean (although we did have an occasional ant problem in the kitchen--not a result of uncleanliness, but unappetizing all the same) but a little worn and run down, especially the kitchen. The bed was okay, the cot was not (this needs replacing--the slats that hold the lumpy mattress kept falling out and the whole apparatus was very flimsy), the pillows were the roll type which some people may find impossible to sleep on. The manager, Paco, was just terrific--personable, eager to serve, spoke great English... a young man with a future! Owner's reply: Thanks for your comment, we really appreciate it because our main goal is the satisfaction of our clients. We have taken several measures in order to offer you the best accommodation possible. The heaters will be turned on before your arrival, so the apartment will be warm when you arrive. Regarding the ants problem, due to the orange trees in the courtyard, we have set devices to fight them. Unfortunately, the slats were loosen during your stay, however we have already fixed them. We have bought new pillows so you can choose the one you are most comfortable with. Best regards. "Très agréable halte au coeur de Séville"
appartement très bien situé dans un lieu magnifique et plein de charme. Certaines prestations un peu sommaires. Le chauffage surtout car avant 11H et après 18H il ne fait pas chaud à Séville mi Novembre!!! et les radiateurs électriques fournis sont insuffisants! En résumé, si nous revenions, nous choisirions exactement le même lieu, mais si possible un appartement avec des prestations supérieures. Très bon contact avec Veoappartment. "Fantastic location. Great on Amenities. 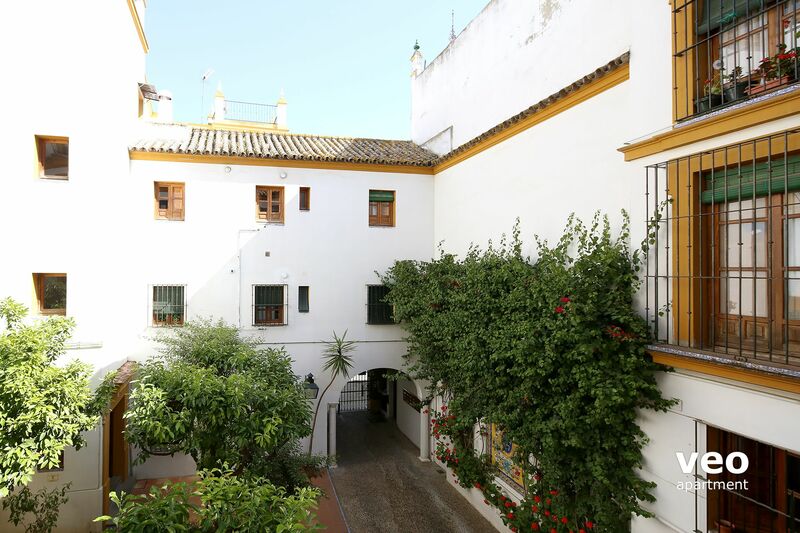 Close by to everything worth doing in Seville"
The house is in near perfect location in middle of Plaza Santa Cruz in the Jewish quarter. 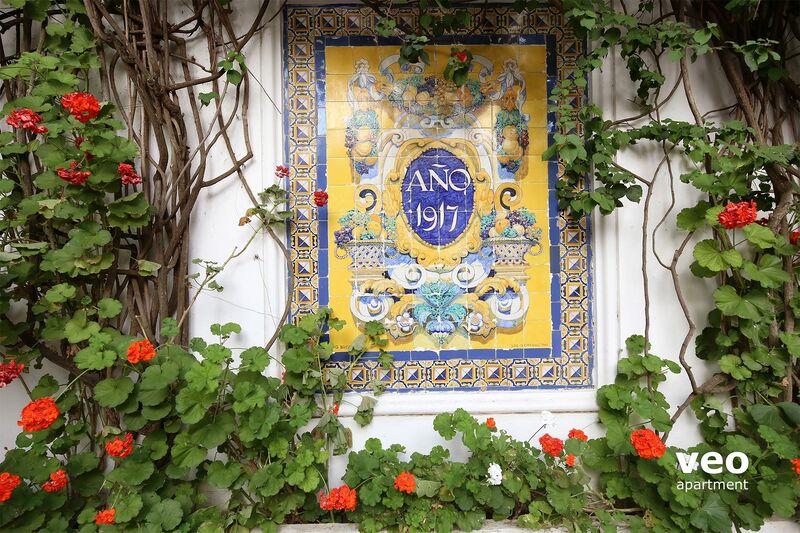 It gives a very good sense of Seville's community life. It is very well maintained, clean and has all amenities like washing machine, microwave, wifi etc. Lastly, it has a good bed in a noiseless neighbourhood, so you have a really good sleep at night. On the negative side, if you are more than 6 feet tall - you may find the bed to be uncomfortable. And the keys of the house need some familiarization. A big thank you to Paco's son who spoke in English and made us very comfortable about the house. The Veoapartment team was exceptional in their customer service. Highly recommend their services and the apartment was great, the location very convenient, the Orange blossom scent is unforgettable. We had a great experience. We had all the appliances we needed, the space sufficient for three adults. Only request would be for wi fi in the apartment to check on emails. 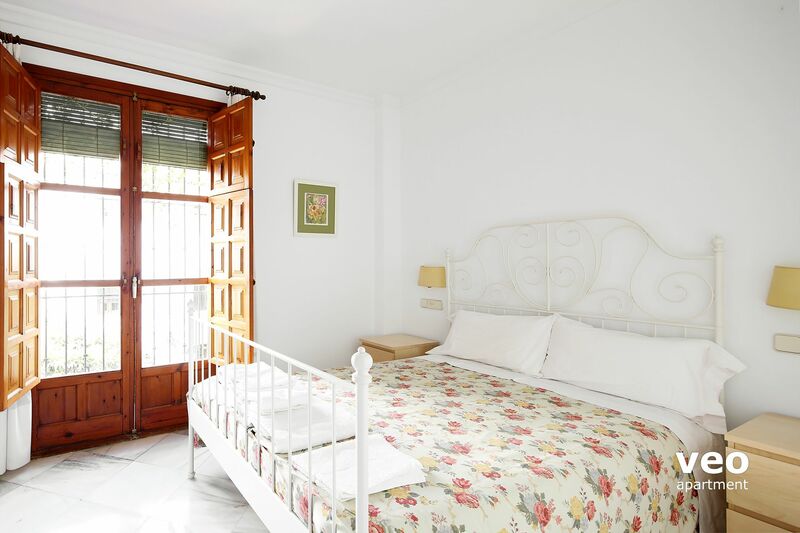 "Nice quiet apartment in the centre of Seville"
The apartment is as described. It is in a perfect location, comfortable and quiet. The property manager Sebrilla was excellent. She met us in the apartment, provided all information about it and about Seville. The only concern is that there were ants in the kitchen and the towels were very old. We didnt use the washing machine so there are no comments. Would be good to have Internet. En líneas generales, buena. El apartamento está muy bien, aunque un poco viejo, y algunas cosas podrían mejorarse. Por ejemplo, la ducha y el agua caliente. El agua sale a poca presión y la caldera se apaga intermitentemente. También sería una mejora interesante incluir WiFi. Thia is an excellent apartment and I would recommend it highly. Aesthetically very pleasing, and comfortable too. A new washing machine would be the only improvement I would suggest. Right in the centre of things, but nice and quiet. 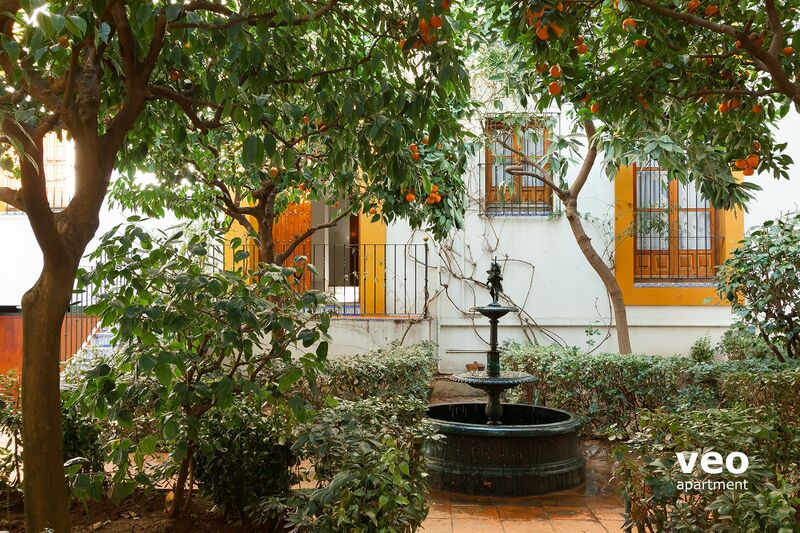 Orange blossom in a delightful courtyard and the prettiest little square right outside. 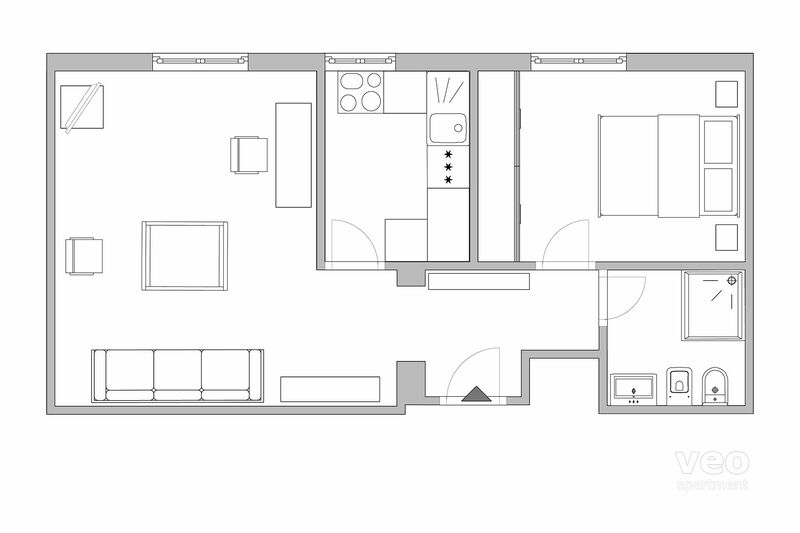 Nice spacious apartment with everything you need for a pleasant stay.